A leopard cannot change his spots, but you can! You may have noticed some new brown patches appearing on your hands, shoulders, arms, or face. These are often referred to as age spots, liver spots or lentigines but don’t let the name fool you – young people can get them too. Age spots are typically flat, brown coloured patches on your skin that can appear in groupings. They’re caused by an increase in skin pigment (melanin) and can be related to sun exposure. Common age spots are harmless, however it’s recommended that you consult with a physician to confirm this if you notice changes in the size, colour, or if the border takes on an irregular shape. 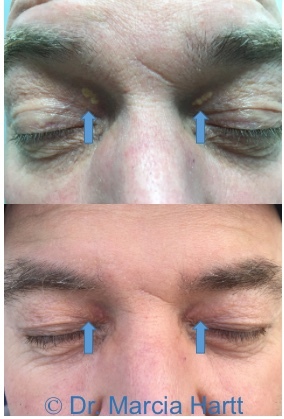 Age spots can be removed using medical grade skin care, chemical peels, SilkPeel Dermalinfusion Microdermabrasion, IPL-DPC Skin Rejuvenation and pigment treatments, as well as Erbium Fractional Laser Treatments. Few people are lucky enough to have naturally flawless skin. We’re usually decorated with some kind of raised lesion. Some lesions are no big deal, but there are others that have you looking for a cover up. It might be a birthmark, a mole, or just a spot that showed up one day and decided to stay! Their may be some colour to it which can range from light brown to black, red, or even blue, or it may be skin colored or white. If you have spots that you wish weren’t there, call Dr. Marcia Hartt for a free consultation. Yes, you CAN change your spots. “Soaking up sun” is an activity that’s highly romanticized. It shouldn’t be. There’s nothing romantic about the damage that can happen to your skin. Sun exposure is actually one of the worst things you can do for your skin. Sun exposure and the ultraviolet rays that come from artificial UV sources are known to cause premature aging – they are an invitation to wrinkles, pigment, and skin cancer. It’s important to minimize the risk to your skin by taking preventative measures. Enjoy the sun, but don’t forget to wear a sunblock cream, long sleeves, and wide brimmed hats. Dr. Marcia Hartt Medical Aesthetics offers effective treatment options to address sun damaged skin, that include medical grade skin care, medical facials, chemical peels, microneedling, SilkPeel Dermalinfusion Microdermabrasion, IPL-DPC Skin Rejuvenation, IPL-DPC Pigmented Lesions, and Erbium Fractional Resurfacing Laser treatments. Do you suffer from chronic brown pigment on the forehead, cheeks or upper lip? If so, you may have melasma. Melasma is a skin condition that occurs more commonly in women than men, and more commonly in those with darker complexions. It’s often referred to as “the pregnancy mask” but melasma worsens in response to other hormonal changes too, such as taking birth control pills or hormone replacement therapy. Melasma is also exacerbated with exposure to sun or heat, and is, therefore, most noticeable in the summer months. 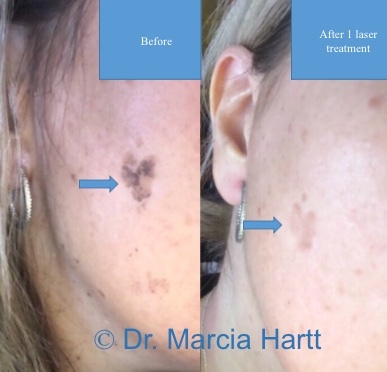 Unfortunately, melasma is incurable, but Dr. Marcia Hartt’s team offers treatments that can greatly reduce the pigment associated with melasma. Call and book your free skin consultation today.